Some real life savers here, like fitting extenders and split nuts for pump unions. These are items you can't pick-up at the local plumbing supply house. This is a very handy item. 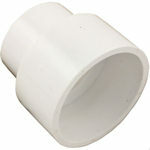 The large end will fit over a standard fitting and the small end allows for a standard connection. This is a split nut commonly used in heater connections. This kit includes a tailpiece, split nut, and o-ring gasket. This is a common pump union kit, with standard threads that fit most pumps made today. Kit includes a nut, tailpiece and o-ring. Pump Union 45 Degree Street 2"
These common threads fit most 2" pumps made today. Includes nut, 45 degree tailpiece, and o-ring.